Catholicism in Northeastern Minnesota can trace its ancestry back to Jesuit missionaries who accompanied French voyageurs on their visits in the 17th and 18th centuries but the Church’s more permanent presence is more recent. In 1835, Bishop Frederick Baraga, from Marquette, Michigan, and his guide, Louis Gaudin, landed on Lake Superior's north shore at the mouth of the Cross River. The site was so named because after surviving a storm-tossed crossing of Lake Superior in an eighteen-foot boat, the men immediately erected a wooden cross on a rock ledge in thanks for their deliverance. Pious Indians called the site, "wood of the soul." Bishop Baraga went on to establish missions at Grand Portage and Fond du Lac, Minnesota. In 1875, the Vicariate of Northern Minnesota was erected to provide for the spiritual need s of immigrants and American Indians. On October 3, 1889, Pope Leo XIII designated the northern half of the Vicariate as the Diocese of Duluth. The first Bishop, James McGolrick, worked to gain acceptance for the Catholic Church through his gentle ways and civil leadership. 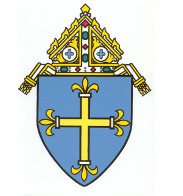 Nine bishops have served the diocese. The current bishop, Paul David Sirba, was ordained December 14, 2009. The Diocese of Duluth numbers over 56,000 Catholics and 92 parishes scattered throughout the ten counties of northeastern Minnesota. Through our parishes we strive to educate our children in the faith, support our seniors, and respond to the broad challenges facing the communities in which we live. We are to be the face of Christ for others. You can learn more about the rich history of the Diocese of Duluth in the book, Our Diocesan Century by Fr. Whitney Evans, Neil Storch, and Bill Beck. The book is available from the Pastoral Center in Duluth for the cost of shipping. Please contact me for more information here.